You always must choose between healthy and tasty junk, have you ever felt like this? I have come across this many a times and have ended up making many guilty decisions. So, I was thinking about some healthy junk. The term sounds controversial, but you will agree with me after you come to know about the option, I have discovered. I am talking about Philips Viva Airfryer, which can cook healthy junk for you. It is a new entry into our kitchen, I am passionate about cooking, however off late it has taken a back seat due to busy schedules. With this new entry I was enthusiastic to try something. Before I explain about the dish I tried, I would like to tell more about the product. The airfryer looks compact, tall, strategically built to accommodate in a small kitchen. The upper section comprises of temperature controller, heating equipment, and fan. You can pull out the lower section like a drawer to place your stuff. There is no provision provided to view the cooking process. The bottom of the container, where you can place the stuff is a metal mesh to allow air to pass through. It is user-friendly as anybody can use those simple temperature and time controllers. At once, the airfryer can cook up to 800 grams at desired temperature. You can bake muffins, drumsticks, potatoes, and spring rolls. Approximately, it takes around 20 minutes to cook whole 800 grams quantity. As a trail, I tried potato chips aka French fries by setting temperature at 180 ° C, with a spoon of oil. I just stirred them once in the mid of the process. The timer sets the airfryer off with a ding sound soon after the set time. The indicator light turns off soon after that. During the process, you can recognize the fan working as it makes small noise, it is not disturbing though. I was excited to see the results by end of 20 minutes. Finally, I was happy to see the soft and fluffy fries without any oil. The fries seemed to be tasty and natural. Now I can have these fries whenever I feel like without any guilt. The wire mesh in the bottom of the device requires some brushing as it houses all the ingredients whichever we cook. But I would say, cleaning is easy any day provided you get some healthy junk to eat. 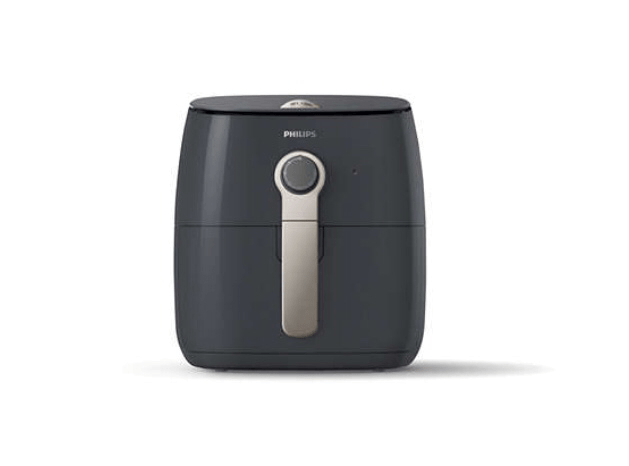 To conclude, this airfryer of Philips is a good buy, if you want to have something healthy and tasty as well.